The Lalbagh Botanical Garden spread over 250 acres in the city of Bangalore, India is a photographer’s and plant lover’s delight . It started out as a private garden(of 40 acres) of the erstwhile rulers of Southern India . It is now a veritable treasure of plants, housing over 1500 species including many exotic ones from around the world. The Lalbagh Garden hosts an annual flower show which attracts over a million people over the 10 day event. Each year, there is a special theme or a main attraction designed. 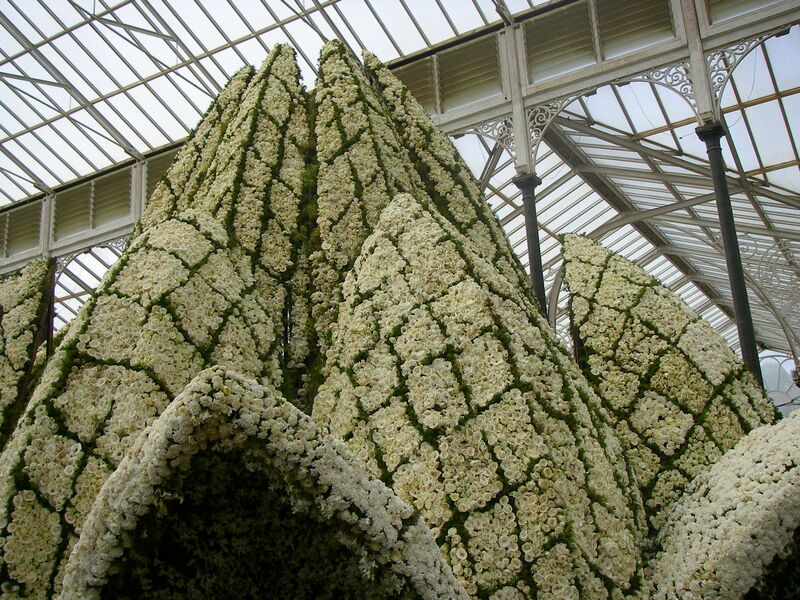 I had visited the flower show a couple of years back and the main attraction that year was the creation of a replica of the Lotus Temple in Delhi, using thousands of flowers . Click on any of the images for a larger view or slide show. Fabulous response to Ailsa’s challenge. Brava! Amazing! Reminds me of our Tournament of Roses parade – imagine the planning, time and work it took to make that temple! That is a huge flower show! Amazing!